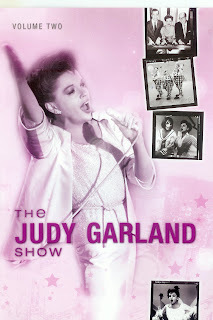 Here’s the second release in a planned 13-volume reissue of Judy Garland’s CBS-TV television show (1963-1964), each disc containing two episodes from the series. The series has already been on DVD, courtesy of Pioneer Artists several years ago, and the packaging and content are somewhat different. Pioneer’s packaging was preferable in some respects, and had much more thorough tracking; one for each song. Infinity only gives us a few track marks, and they frustratingly indicate the segment though not the name of the guest star or the actual song title. Quality-wise, Infinity’s version look superb, perhaps not enough for fans who own the Pioneer issues to re-buy the entire series, but certainly warmly recommended to everyone else. The shows on “Volume Two” include her classic pairing with Barbra Streisand, which aired 10/6/63, when Streisand was at the pre-“Funny Girl” start of her career, the Smothers Brothers (whose own show would eventually find success – and controversy – in Garland’s time-slot a few years after CBS canceled her series), and a cameo by Ethel Merman. Streisand was so good, the appearance lead to her landing her own contract with CBS for a series of acclaimed specials. Garland’s two medleys with Streisand have become classics, one a brilliant melding of Garland’s “Get Happy” and Streisand’s early hit, “Happy Days are Here Again,” the other an intricate love song medley. In both, Garland’s admiration for the rising young star is palpable. The other, which originally aired 3/1/64, reunites her with MGM colleague Jane Powell who, we’re reminded twice, replaced Garland in “Royal Wedding” when Garland’s health problems interfered, and her Yellow Brick Road co-star, Ray Bolger, who had played the Scarecrow. The latter joins her for her regular “tea” segment, and they reminisce touchingly about “The Wizard of Oz.” And most interestingly, they’re joined by Powell for “The Jitterbug,” a number cut from the movie. Not all the comedy material and patter between songs is top notch – series regular Jerry Van Dyke’s lip-synching of MGM leading men is a particular low point -- but on the whole, quality is high, and make one sorely miss the variety show genre today. Garland is in excellent voice on both episodes, though she does occasionally exhibit the nervous mannerisms that are said to have alienated viewers at the time. The Powell-Bolger show is quite different in content than the Pioneer version, which included her solo renditions of “Hello, Bluebird,” “If Love Were All,” and “Zing Went the Strings of My Heart,” actually taped at another time. These presumably will show up on Infinity’s release of the Bobby Darin episode of 12/29/63, where they eventually landed.